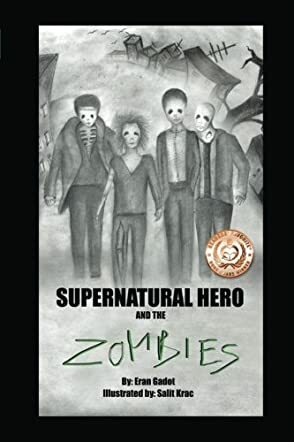 Supernatural Hero and the Zombies by Eran Gadot is a fun preteen book, book 3 in a series. We meet Andy again as he is getting ready to spend his summer with Zoe. Andy's 'to do' list involves things like going to the beach with Zoe, spending time with Zoe, and basically being with Zoe. This plan could go really well if zombies were not such a big problem. Andy can also talk to ghosts and his grandpa's ghost takes center stage. Dealing with his grandpa's death, Andy begins seeing his ghost. I found this to be an interesting way of introducing preteens to death, and also the message that those we love never truly leave, even though they do not stay around us as ghosts. Supernatural Hero and the Zombies by Eran Gadot is a fantastic preteen book. Dealing with a lot of themes from love and death to school and bullies, this is a well rounded book. As a adult, I decided to give this book a try because it sounded interesting and I was not disappointed. Andy deals with problems that most preteens would deal with, and I was able to relate in some ways to him. I enjoyed the pacing of the story and the humor within. The art work throughout is amazing. I found myself staring at the illustrations. I loved the way the pictures were pencil drawings and that added so much to the story. I feel that adults, teens, and preteens will be able to enjoy this series.